For almost a decade, Scott Holton has leveraged his knowledge and hands-on technical experience to support J&P Cycles’ customers. To say Scott embodies the spirit and enthusiasm exemplified by John Parham, founder and president of J&P Cycles — who believes customer service and technical support are the most important differentiators for J&P in the motorcycle parts and accessories marketplace — would be an understatement. If you’ve ever contacted J&P technical support through chat, phone, or e-mail, there’s a good chance Scott has been the one to answer your question. Whether you have a vintage Panhead or a 2010 Fatboy, Scott’s knowledge of Harley-Davidson motorcycles is sure to impress, as is his commitment to you — our customer — and his passion for motorcycling in general. Before Scott gets too far along in his blogging career, we thought it would be good to introduce him to you readers through this brief Q&A. A: I got my first bike from my uncle in 1970 when I was 13, and I’ve been riding ever since. It was a Montgomery Wards Riverside 250cc street bike. 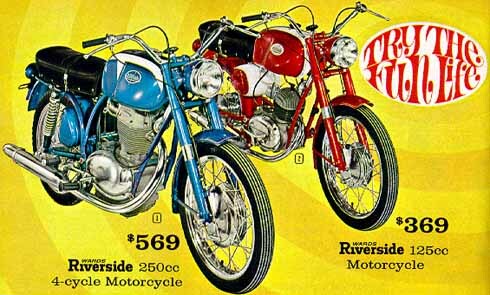 The bike was made by Benelli and marketed by Wards to compete against Sears’ Allstate brand. I got my first Harley when I was almost 19 — a 1956 Panhead 84” stroker. I started watching movies like “Hells Angels,” “Billy Jack,” and “The Long Ride.” One of my favorite TV shows back then, “Then Came Bronson,” also played a big part for me (I liked the whole idea of being independent and free, and I get that from riding). Easyrider Magazine was a big early influence, also. A: Prior to joining up with J&P in May of 2000, I worked for motorcycle industry giant S&S Cycle as a warranty technician. For several years before that I had my own motorcycle repair shops in Virginia, Arizona, and California. Between ‘93 and ‘96 I was an instructor at the Motorcycle Mechanics Institute (MMI) in Phoenix, Arizona. I attended MMI from late 1986 through early 1987. A: I have been fortunate enough to be here at J&P for almost 10 years. My job covers a lot of things. I have been taking care of our online Forum under the name Xea since December of 2000. I also spend a fair amount of time answering tech e-mails and web chats from all over the world. I do parts inspections as needed to determine the reasons for parts failures or manufacturer defects, and I work closely with our quality control department to spot trends and issues with particular parts, or the vendors who supply them. I also write tech articles and Blog entries for the J&P website, and I assist with escalated customer situations relating to improper installation or manufacture defects. I’m also a mentor to our younger tech staff (I train and educate our sales staff to improve their technical knowledge). Oh, I’ve also taught a lot of housewives to sell motorcycle parts over the years! A: Currently I ride a bike that has a special construction title. It has a 2003 Indian Powerplus 100 Bottle-cap engine in an Early 4-Speed FL frame; an upside down 54 MM fork, riding on 3.5 X 18 and 5.5 X 18 wheels sporting a 130MM front and 180 MM rear Metzeler tires complete the rolling stock; Drag Bars; and 7 gallon fatbobs with a full strutless rear fender complete the look. A: I have the greatest job in the world. I get to sit and talk about bikes all day, and I get paid for it. I get hands-on exposure to all the new parts and accessories offered by the world’s top suppliers. It doesn’t get any better than that. A: I’ve built so many over the years that my dream bike will always be the next one I build. A: The last book I read was a text about table saws (sounds exciting, huh?). For light reading I just finished Breaking Dawn by Stephanie Meyers. Have a 2000 Heritage that is heavily cammed, thus the coil mount that goes to the frame broke into.no access to a mig any ideas that would not reqiure welding. I also have a set of air horns at the original horn location which do take up a lot of the left side of the engine. Thoughts? Please send an email to tech [at] jpcycles [dot] com and let us know which engine and transmission you are interested in. We will be happy to put a quote together for you. Will you be needing a primary as well? Always have been a big fan of the forum. It has always helped me out when I need anything. Thanks! Thanx for the good words. The Forum has always been one of the favorite parts of my job. I’m actually getting some help there these days from Speedking72. That is fellow blogger Bud Milza. Between the two of us we hope to keep up with all the questions presented there. If we may, let’s talk metric for a min. 2000 V Star 650 custom. Less than 15K miles. 19 front tire 15 rear. What I want to do is put a larger tire on the front. I’m thinkin’ a 16. Kinda going for that HD Fat Bob look. (which I can’t afford right now). My Q is, how will the larger rim and tire affect rake/trail, handling and stability of said scoot? I know I’ll have to re-work the forks to make room for the wider rim and tire. Is this just a pipe dream, or can it be done safely? Evening Jeff. the larger rim may make no difference in rake and trail because the overall radius of the wheel/tire combination is what makes the change. Radius is 1/2 of the diameter of the wheel/tire. If you use a combination that has an inch taller diameter, it will only affect the radus 1/2″. A larger diameter will increase rake and trail slightly. A smaller diameter will decrease rake and trail slightly. As far as if this can be acomplished, only your fabrication skills are a holdup. When I started riding there where not places like J&P that parts could be bought at and everything you had to fabricate yourself. I’m not aware of any comercially availabe kits to add the wheel you want for your bike. Here is a link to an article I wrote that will explain the effects on handling. Gary, let me look into this for you later today. I’m going to have to do some research to get a good answer for you. I’ll post again later. You walked me through putting my knucklehead (that I inhierited) back together over the phone. I had zero experience with HD bikes. It runs like a top! I’m glad that I finally get to put a face along with the voice. Neil, I’m pleased for you. Knuckles are truely things of beauty. I remember our conversations. Pete, while it can be the coil, your description of the circumstances lead me more to the ignition module. The conditions you give us are classic for a module failure. Thanx Jeff, I’ll pass that on. Swamprat, I wish they would release “Then came Bronson” on DVD. I would love to have it. Larry, What PN are you waiting for? I can check to see if we have it in stock. Did you have another question? Another great influence was David Manns Paintings. Hey, Scott! Great article. Question for you. I have a 63 pan that I built and still use the stock Y line for the outside oilers. As you no doubt know they do not have flares; just a square o ring seal. the seals eventually deform and leak after a time. I ordered a different set up through Chuck in Daytona but it has been on back order for several decades. I think he said it was actually a V Twin offering. By the way, I installed a Morris Mag with an impulse coupling for easy starting and it works great. Wish J&P had offered it. I would have bought it from you guys. Thanks for your help and keep up the good work. Your 2009 is one of the new “Fly be Wire” control sets. I havn’t developed any new truck for installing these, but they are pretty straight forward. I’ve included a set of intructions from a kuryakyn grip set of this vintage to let you know what is required. m going to include today a set of instructions for a Kuryakyn 08-10 “Fly by Wire” grip change so you can see what is required. Scott, Screaming Eagle parts are available only through Autherized Harley Davidson Dealers. The SE parts are Harleys brand performance parts. While we do not offer the Pro Tuner, we do offer the Thundermax (also the Thundermax with autotune), the Vance and Hines Fuelpak, and the granddaddy of them all, the Power Commander that does the same job. CroK, what a good looking young man! Keep it up! Does J & P sell screaming eagle Pro super tuners? Great Name! Well last summer here in michigan was my first with a 2009 fxd Super Glide. Love it after getting some experience and taking the riders edge coarse I took my first long trip. From Battle Creek Michigan over the bridge thourgh the U.P. and to Milwaukee to the Harley Museum and then back the same way 1,446 miles 3 days. Love it, this summer out to see my Dad he lives 10 miles from Mt Rushmore. Love J & P cycles will be buying a new rear tire this spring. That sounds as if you have a wiring issue. You will have to trace each wire in your service manual’s wiring diagram (you do have one, don’t you?) to troubleshoot this. Buford, yes it is possible for you to have a leak at the cable. There is an o-ring that is on the cable’s threads where it screws into the transmission cover. While not a situation I have seen, I’ve heard reports of oil seeping from the cable housing itself. This would be difficult unless the housing where damaged. Another possible contributing factor can be a transmission that is over full. That should give you a few things to look at. Keep me posted on how things go! scott is it possible for oil to leak from the clutch cable on my 2005 eletraglide classic? a small drop of oil drops from the cable area where it passes under the engine, i have cleaned the area many times and it looks like the leak is form the clutch cable. the leak is not much because i have not had to add any oil to the transmission. Wow guys, this is pretty overwhelming. Nick, I apologize, when we where corisponding I had some health issues. All is well now, and if you would like, we can resume through the J&P portal. Would you like me to initiate it? Tood, thank you for your kind words. At one time I taught at Motorcycle Mechanics Institute and there are times I miss it. Doing that seminar with Merill is about the only time I get to speak in front of a group these days. David, I’d like to find one of those old rascals for sentimental reasons. I’d like to restore it with my son who is just a little younger than when I started riding. It would be neat to show him my motorcycle roots. JT, Thanx for letting us help you out. To all, It’s guys like you that make J&P a great place to work….. Keeping the world on 2 wheels, one customer at a time. Great article! Always have been happy with J&P parts & customer service. Hi Scott- My Best friend Rick had a Riverside when we were that age- seemed like it was a two stroke- but can’t remember for sure….we had a a heck of a time keeping it running- also was pretty hard to start some times- might have something to do with all of the dirt riding we did with that street bike! Rick and I both grew up and went on to Harley’s (after several Jap bikes each) – thanks for the memories! Love the article, just want to tell everyone that I attended J&Ps Winter Workshop on carburators, fuel injections and suspensions. I have to say you are the master machanic!!! I can’t tell enough people how great that class was. You and the other J&P trainer was outstanding. I really learned alot. Thanks for offering that to your customers. Hi Scott! Saw this article and had to say “HI” Knew you from your days in Madison. I had (still do) red 97 Dresser. You put a tire on one coldass February day in ’98. Good to know what you’re doing. Take care! Hi Scott, I think we’ve spoken before about XL883C Tacho’s – but that’s all sorted now. One thing you may be able to help with – I’d like to get rid of the standard Ignition Key/Switch assembly on my XL883C, then replace it with a 30-Amp, 2-pole plunger switch that I have. This will fit neatly inside the speedo binnacle, atop its standard (on the Custom), riser, with the two wires from the switch hidden behind the rear riser plate & down to where the original switch was. I plan to link the two “downstream” cables from the standard switch – for Ignition & Lights – as the lights are on all the time anyway. With one wire from my new switch to the 12v input cable and the other switch wire to the paired ‘output’ wires, we should be ‘good to go’ – but my only concern is what kind of constant current draw am I likely to get across the switch, with both lighting (head, side & tail lights), plus ignition (mainly coil Primary winding loads x2), when running? I’d rather not have too much heat inside the speedo casing, if I can avoid it – but that (for me), is the perfect place for a “Hidden” ignition switch. And all other switch functions (Engine starter & ‘Kill’ switches plus headlight main/dip beam), remain unaffected with this modification. welcome aboard, J&P my only parts supplier. Hope to talk to you soon. just removed theprimary cover to look into the non funtioning starter on my 99 fat boy. I can observe the pinon gear extend to msh with the ring gear however thas all tha happens.I can hear what sounds like the starter spining, but the pinion gear isnt turning. Whats the next move, Im a bit stumped here. Thank you for your kind words. I enjoy coming to work every day. Interesting stuff ! Good Q & A. Good Spirit Keep it up Scott. Good morning Steve that’s a great question. Doing the rocker bolts on a Twin Cam like your Dyna or any Evolution built from 1984 are a bit difficult to get tight. Here is my method. You are on the right track with the 3/16″ adapter. The 1/4″ allen bolt is tightened with a 3/16″ allen wrench. I have a piece of an allen wrench about 3/8″ long that I cut from the end of an allen wrench. I put this peice of wrench into the allen bolt, then use the torque adapter to pull to the correct value. I keep a couple cut pieces of allens in different sizes to help in tight quarters like this, they have come in very handy over the years. Thanks for the question, and keep them coming! ENJOYED THIS Q&A. WISH I HAD A JOB LIKE THAT. I RIDE A METRIC AND TEACH WOODSHOP TO SPEC.ED. KIDS. HAD A HARLEY WHEN THEY VIBRATED 40YRS. AGO. PLAN TO BUY A HARLEY 2 YRS, FROM NOW, WHEN I TURN 63.